Almost everyone I know is afraid of sharks. Even if I wanted to be a mermaid when I was little, and there are vegetarian sharks in the movie Shark Tale, I never thought in a million years that I could be swimming with them. And that also includes sting rays, because in our household, there’s a myth that being whipped by their tails will make that your last day of existence. 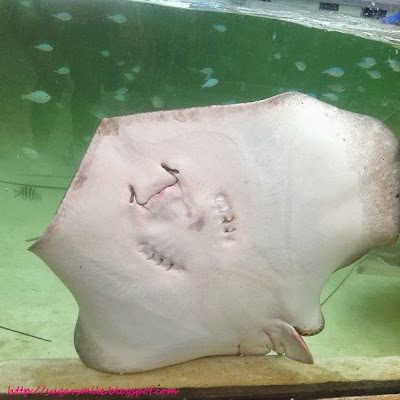 But with Manila Ocean Park’s newest attraction, the Sharks and Rays Encounter, you’ll feel like Ariel and get friendly with these (once) scary creatures! Before meeting the stars of the attraction, we were briefed with the proper handling of the sting rays and its different species. Did you know that there are five of them? 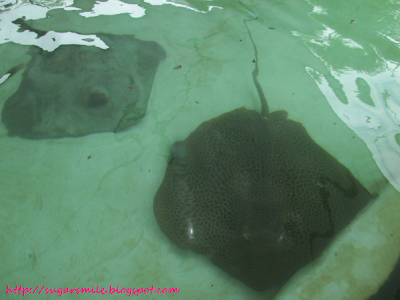 The Jenkins’ whipray, Leopard whipray, Black-botched Ribbontail Ray, Mangrove whipray and Cowtail stingray. I personally liked the leopard because of its attractive prints. It almost seems unreal. 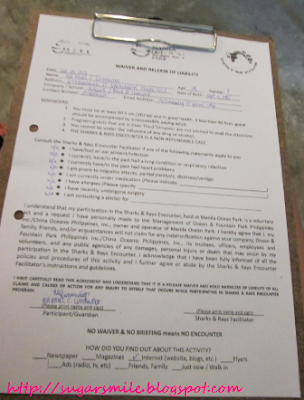 For the sharks, Manila Ocean Park houses the Tawny Nurse Shark and the Bull Shark. If you’re going to the encounter, you must sign the waiver form first, for your safety. This is also to ensure that you are in the proper condition before interacting with them. 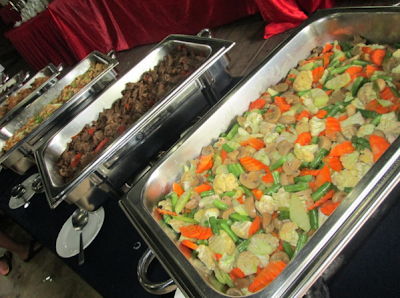 We also had a buffet lunch at the Liquid Bar Pool and Lounge and had these sumptuous feasts. I think it’s important that you have a balanced meal because you need all the energy so you could swim and enjoy the attraction. 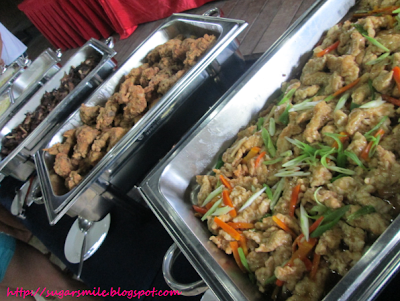 First up, we had the Dry Encounter (Php300). 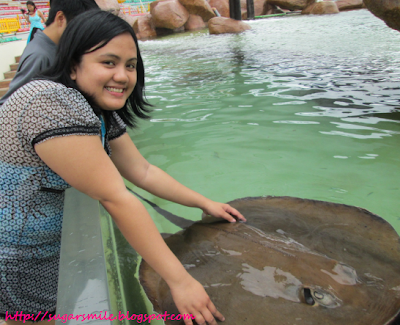 Separated by an acrylic panel, you can get the chance to have a photo opportunity with the sting rays while touching and feeling them. If you don’t have much time or in a large group, this is the attraction that you would enjoy the most. This stingray is inviting you to smile and play! If you’re feeling a bit adventurous, there is also a Shark & Rays Half Body Encounter (Php800). 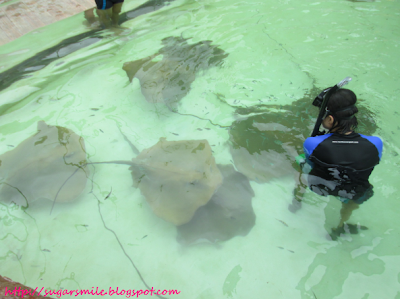 You can go in a waist-deep water to play with the sting rays. One tip, you have to be in shoulder level with the water to hold them. What I love about this is how the rays swim while touching your feet. It’s a bit slimy, but so worth it. 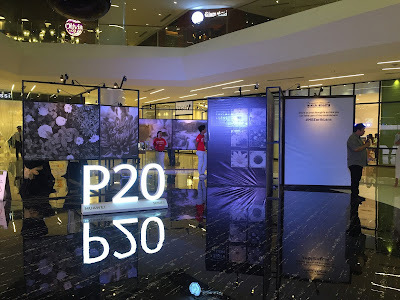 The rate is inclusive of a souvenir item, photo opportunity and a certificate that you finished the encounter. 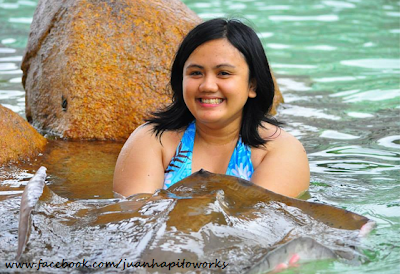 The Sharks and Rays Full Body Encounter (Php1500) is one wish fulfilled in my bucket list. Now it’s not just a once in a lifetime experience because you can get to swim with the trained and gentle sharks at the Manila Ocean Park. At first, I was hesitant to swim in the same pool as theirs, but when I got to know more about them, it wasn’t scary anymore. 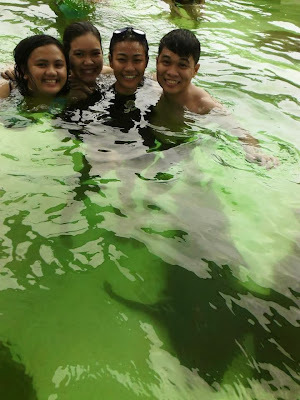 Thanks to Clariss and Japhet, we even have a photo with the shark under our feet. Coolness isn’t it? This program is also inclusive of a souvenir item, photo and certificate. 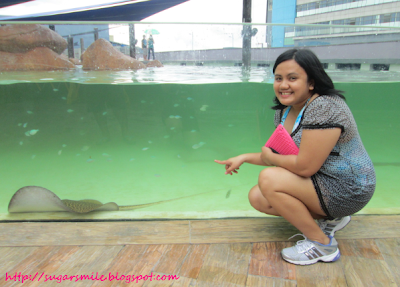 For a more fearless encounter, Manila Ocean Park also offers the Aquanaut (Php1500) attraction. You’ll get the chance to be inside the Oceanarium to meet the marine animals and the sharks up close! You will have a specialized helmet to enjoy swimming in the deep and even feed the docile sharks. This is definitely a must-do when I visit the Manila Ocean Park again. And since Christmas is getting near, Manila Ocean Park also offers the Shark and Rays Intimate. This is a specialized CSR program where the persons with disabilities and special needs will get to encounter the attraction as well. This is with the supervision of trained divers so advanced booking is a must. They can also receive a souvenir item, photo and certificate. How about you? Do you want to face your fears too? 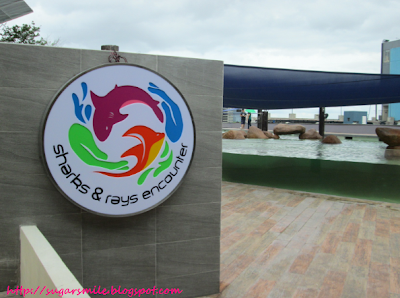 The Shark and Rays Encounter is now open at the Manila Ocean Park for you and your family to enjoy! For more details and promos, visit their website at www.manilaoceanpark.com or call 567-7777 loc 153.